Mahāprabhu taught the principle of devotion to one’s worshipable deity through Murari Gupta. One cannot advance in devotional service without a particular devotion to a worshipable deity, or iṣṭa-devatā. Murari is an avatāra of Hanuman, and he saw Chaitanya Mahāprabhu as Ramachandra. Murari Gupta is Hanuman in Ramachandra’s lila; Purandara is Angada and Govindananda is Sugriva. The word gupta means “hidden”, so the name Murari Gupta indicates that Murari (Śrī Chaitanya Deva) had secretly taken up permanent residence in his heart. Murari Gupta took birth in a family of Ayurvedic physicians in the district of Sylhet. Murari Gupta is a physician for the disease of material life. He was amongst the many associates of Mahāprabhu who appeared in Sylhet. Murari would cure anyone who came to him, whether their disease was of the body or the soul. The names of Murari’s parents are unknown. He was somewhat older than Mahāprabhu. The Chaitanya Bhagavata includes his name in the list of associates who appeared prior to Mahāprabhu. There were many devotees hidden in Nabadvīpa who had previously taken birth at the Lord’s command. They included Śrī Chandrasekhar, Jagadish, Gopinath, Sriman, Murari, Śrī Garuḍa and Ganga Das. When Murari’s family moved from Sylhet to Nabadvīpa, they lived in the neighborhood of Mahaprabhu, so Murari was Nimai’s companion in many of His childhood pastimes. It is also written in the Chaitanya Charitamrita that Murari witnessed Mahāprabhu’s childhood pastimes. He had authored the scripture Sri Chaitanya Charita. Murari Gupta was also a student at Ganga Das Pandit’s Ṭol (school) along with Nimai. When the Lord was engaged in His pastimes of learning and study, He would often debate and joke with Murari . Mahaprabhu would be pleased with Murari’s interpretations. Murari Gupta was also amazed at Mahaprabhu’s wonderful intelligence and learning. He also observed that just the touch of Nimai’s hand would immerse him in ecstasy. All these things convinced him early on that Nimai was no ordinary human being. Murari Gupta became a good scholar by the Lord’s mercy. One day, Nimai was pleased with the explanations of Murari Gupta to a certain problem. He touched Murari with His Lotus hand, filling His companion’s entire body with ecstasy. Murari Gupta thought privately that this person could in no way be an ordinary human being. Can an ordinary human attain such scholarship so quickly and his mere touch brings such ecstatic pleasure? 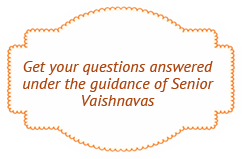 The Vaiṣṇava’s ornament is humility. Mahāprabhu’s heart would melt when He saw this quality in Murari Gupta. Murari Gupta, the twenty-first branch of the Chaitanya tree, was a storehouse of love. The Lord’s heart would melt when He saw Murari’s meekness and humility. When Mahāprabhu returned from Gaya, He saw Murari at the house of Shuklambar Brahmachari. Murari had heard of Mahāprabhu’s ecstatic feelings from Sriman Pandit. Mahāprabhu was pleased with Murari and one day gave him a vision of His form as the Varaha avatar; the Lord lifted Murari’s water jug on His nose as He gave a loud roar. Murari considered his life to have been fulfilled by this vision and he sang a hymn in glorification of the Lord. This event has been beautifully described by Vrindavan Das Ṭhākura in the Chaitanya Bhagavat, Madhya-khaṇḍa, chapter 3. The Lord took on the mood of Varaha in the house of Murari. The Lord climbed on his shoulders and danced in the courtyard. Murari Gupta was a worshipper of Lord Ramachandra and Mahāprabhu’s affection for him resembled that of Lord Rama for His servant, Hanuman. Lord Gaurahari felt great love for Murari Gupta. It was just like Lord Ramachandra’s love for Hanuman. During the twenty–one hour great epiphany (mahā-prakāśa) at Srivas Angan, the Lord gave Murari a vision of Himself as Lord Rama. When he saw his worshipable deity before him, Murari fainted away. He then glorified the Lord in a way that so much pleased Him that He gave Murari a benediction to have all his desires fulfilled. 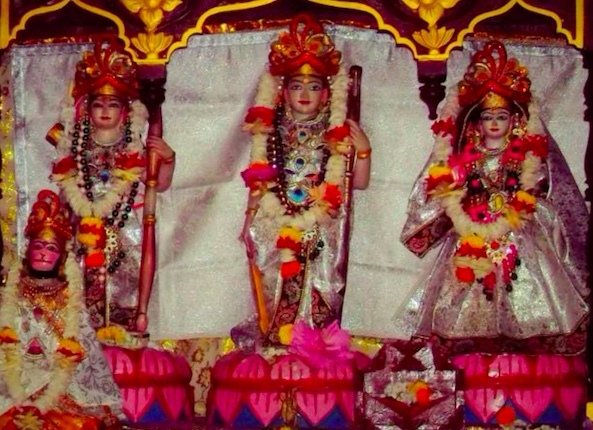 Mahāprabhu ordered Murari: “Behold My form!” Lo! Murari saw the form of Raghunath directly before him. He saw the Lord of the Universe with swarthy color of durba grass, sitting in the vīrāsana, the posture of a great bowman. He saw Sita and Lakshman standing on both side of Him and His army of monkeys surrounding Him singing hymns of praise. It seemed to Murari that he was himself one of the monkeys, and as soon as he saw this, he fainted. The best of the physicians, Murari, lay unconscious on the ground, completely under Mahāprabhu’s spell. On one occasion, when Mahāprabhu heard Murari Gupta recite the glories of Ramachandra, He wrote Rama Das, “servant of Lord Rama”, on his forehead. (Chaitanya Charitamrita 1.17.69) On another occasion, Mahāprabhu displayed a four-armed Narayan form in the house of Srivas Pandit, and began calling the name of Garuḍa. Murari Gupta heard the call, and giving a loud roar, took the form of the king of birds. Mahāprabhu then climbed on his shoulders. This lila is described both in the 20th chapter of the Madhya-khaṇḍa of Chaitanya Bhagavat, and in the 12th wave of Bhakti-ratnākara. Mahāprabhu taught the spiritual truths about Himself, Nityananda Prabhu and matters of etiquette through Murari. One day, Murari Gupta came to Srivas Pandit’s house. Upon arriving, he first paid obeisances to Mahāprabhu and then to Nityananda Prabhu, but Mahāprabhu told him that he had not followed the proper procedure. Murari could not understand what He meant. That night when he returned home, he had a dream in which he saw Nityananda Prabhu as Balaram, and Mahāprabhu as Kṛṣṇa with a peacock feather. Murari then understood what Mahāprabhu had been telling him. The next day he paid obeisances first to Nityananda Prabhu and afterwards to Mahāprabhu. The lotus-eyed Mahāprabhu was sitting down with the smiling Nityananda Prabhu at His right hand side. Murari paid obeisances first to Nityananda Prabhu and then to the feet of Vishvambhar . Mahāprabhu had great affection for Murari Gupta and so would give him His own pan (betel leave), which Murari would eat with relish. When Mahāprabhu told Murari to wash his hands, Murari would simply wipe his hands on his head. It was at this time that Mahāprabhu suddenly began to criticize the false views of the Smarta Brahmins and Prakashananda’s māyāvāda philosophy. The Lord is very happy to accept a devotee’s offering, no matter how it is made. One day Murari returned home and told his wife that he wished to eat. His devoted wife carefully prepared rice with ghee and gave them to her husband. But Murari, absorbed in contemplation on Kṛṣṇa, took handful after handful of the food and put them on the ground, offering them to the Lord in this way. The amazing thing is that even though Mahāprabhu was not physically present there at that time, He accepted the offering. The next day He came to Murari’s house at the dawn and said to him, “I have come to you for medicine. Yesterday you kept insisting that I eat. You made Me eat so much that now I have indigestion. You must give Me some water, that will be the remedy for My stomach problem.” Mahāprabhu took water from a jug in Murari’s house, drinking down its entire contents. Seeing this, Murari fainted and all the devotees began to cry in deep love. Murari Gupta analyzed the many avatāras of the Lord and came to the conclusion that these avataras manifest pastimes and at one point conceal them. Lord Ramachandra destroyed Ravaṇa to save Sita, but then He abandoned Her. Kṛṣṇa arranged for the destruction of the Yadus. Thus, Mahāprabhu too would inevitably be disappearing at a certain moment, it would be better for him to depart before that day arrived, for it would be far too painful for him to witness such an event. For this reason, Murari purchased a sharp chopper and kept it hidden in his home. The Lord knew of his intention and immediately came to his house and asked Murari to hand over the chopper. Both the above mentioned pastimes are described in the Bhakti-ratnākara’s twelfth wave. Murari Gupta would also go on the annual pilgrimage with other devotees to see Mahāprabhu in Puri. Accompanied by his wife, he would offer Mahāprabhu with many preparations they had prepared themselves. Murari would participate in the Rathayatra festival as a member of the third sankirtan group in which Mukunda Datta is the lead singer and Hari Das Ṭhākura danced. I have sold my head to Ramachandra. I cannot remove it from His feet, for as soon as I try, it causes me great pain. I cannot give up the lotus feet of Raghunatha, even though this means disobeying You. What can I do? O merciful one, please allow me to give up my life here before You rather than suffer this fate. Hanuman is famous for a verse, in which he shows his single-minded devotion for Rama. Both Narayan, the husband of Lakshmi, and Ramachandra, the husband of Sita are equally the supreme personality of Godhead. Even so, the lotus-eyed Rama alone is everything to me. Murari Gupta disappeared on the same full-moon day as the autumn rāsa-līlā festival, sarat-purnima.